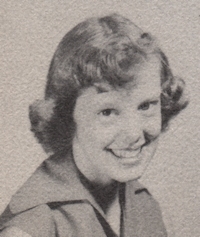 Obituary – Clark, Kathleen Carole (Wyatt) « Perry High School Alumni Association, Inc.
Basketball Queen 51-52, Home Room Vice-President 51-52, Home Room Secretary and Treasurer 49-50, Library Staff 51-52, Perryscope Staff 52-53, Courtesy Guide 50-52, Class Assemblies 49-51. 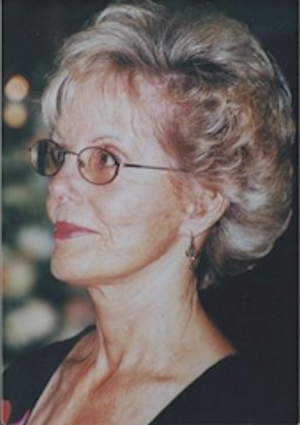 Kathleen Carole Clark was born on November 7, 1935 to Ruth and Elwin Wyatt in Perry, Oklahoma. Kathie or “Diddy” to her family passed away on January 5, 2016. Kathie was born and raised in Perry, Oklahoma where she attended school. She grew up on the Wyatt family farm. Kathie loved spending time with her sister Sonya and their cousin Jeanne. She loved her family and the freedom of farm life. Kathie and Sonya each raised a calf and trained it to ride like a horse, ultimately riding them in the Cherokee Strip Celebration parade. Later her dad acquired horses for the girls. Kathie loved her horse Taffy which she rode until she left for college. While attending Perry High, Kathie began dating her one and only love Bob Clark. Bob was an athlete and together they were the 1952 basketball captain and his queen. They married July 2, 1954. Kathie graduated form Northwestern State the same year as Bob, obtaining her Bachelors of Arts Degree in just 3 1/2 years. In the early years they lived in Colorado, New Mexico, Arizona and Southern California where she worked as a teacher. Bob and Kathie welcomed their first child Kevin Troy August 27, 1958. They family grew with the arrival of Kimberly Rae two years later and was complete with the surprise of their youngest son Shannon Scott. The couple moved to Oroville, California in 1965 where they both work for the Oroville Schools. She was a much loved and respected teacher. Kathie recognized how some children were coming to school without breakfast, so she would buy bread and peanut butter and make sandwiches for her class each morning. She always said, “A child can not be expected to learn when they are hungry.” This silent and giving spirit was a theme in her life. She was very intuitive and always tried to find a way to fill a need, be it food, time listening or sharing her wisdom. Kathie enjoyed skiing, boating, golf, tennis, reading, gardening and her family. She volunteered for numerous organizations and was a life long learner. She enjoyed travel and was fortunate to visit many places of interest to her. Both her parents and her first son Kevin Troy preceded Kathie in death. She is survived by her husband Bob Clark, daughter Kimberly Bobber (husband Bobby), son Shannon Clark, grandson Cody Naglich and granddaughter Elaine Ruth Clark.